22 handwritten letters sent to Menachem Zaharoni by his uncle, Benjamin Yaroshevsky, a holocaust survivor. Most of the letters were sent from a detention camp in Cyprus, two from the detention camp in Atlit, and one from a DP camp in Bavaria. June 1946 to June 1947. 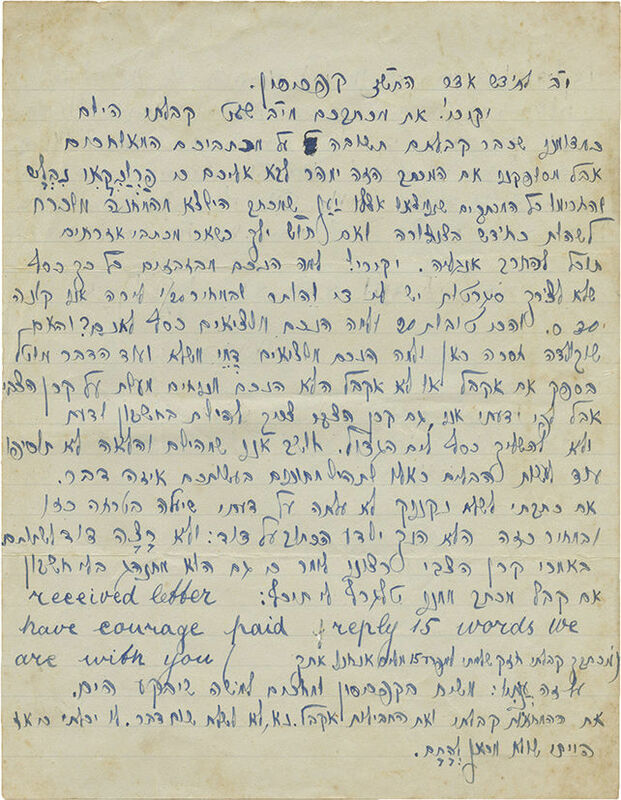 Mentioned in these letters are, among other topics, Yaroshevsky's grief after the holocaust, locating surviving relatives, sentiment of revenge against the German nation, the Zionist enterprise, David Ben-Gurion, life in the detention camp and the Jewish identity. In early letters Yaroshevsky deals in detail with the holocaust using, often enough, a harsh and sharp language. In a letter dated 27 Heshvan, 1946, for example, he writes: "why were we slaughtered at the last minute?...you want to kick, to burn and to bomb the entire world…". Further on the letters are focused on the future of Zionism and building the land. In a letter dated Nisan 13, 1947, it is written: "No point in crying and weeping, this way we shall not save and not be saved, it is a new era in our history, a period of life and work, of strengthening the people and gathering it to the land of its ancestors". Two letters were sent from Atlit detention camp and they reflect Yaroshevsky's overwhelming excitement following his arrival in Palestine. Total of 22 letters. Size and condition vary. Overall good condition. Folding marks, stains and creases. Small tears at margins of a few letters and filing holes to one letter (not affecting text). One letter is cut width-wise and lacks the upper part. One letter is possibly lacking the top part.